Thank you for visiting Boiler Services Dublin. We undertake contract boiler servicing for property managers throughout Dublin. We are Ireland's largest independent specialist boiler servicing company. We have over 40 years experience in dealing with every make and model of boiler produced. 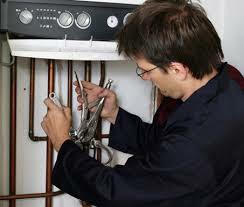 This means we are accustomed to every problem that may occur with a boiler no matter how new or old it may be. As you are probably aware all boiler manufacturers recommend that boiler servicing should be completed on a yearly cycle. This is due to boiler performance, reliability and health and safety. A recent independent study stated that servicing a boiler for the first time in 3 years saved nearly €200 on fuel costs the following year. This we know is not a major point for property management companies. The health and safety aspect is though. Reduced insurance premiums for management companies and landlords is the driving factor. Regular boiler servicing can prevent toxic emission leaks, water leak damage to common areas, possible electrical damage preventing fire possibilities and more. 10 Reasons for contracting us for your boiler servicing. All of our team are qualified R.G.I. registered plumbers who decided to hone their expertise and specialize in the boiler services industry. All staff are thoroughly vetted prior to employment. This includes qualifications, references and up to date health and safety training. We work around the time frame of the management company and tenants. We are available all round the clock including early morning, evenings and weekends. We operate a guaranteed 24 hour a day, 7 day a week, 365 days a year emergency boiler service and for all other plumbing emergencies. Reduced boiler service prices for multiple units. Reduced costs on replacement parts where applicable. Due to the size of our company we can get great bulk wholesaler discounts. Excellent customer service and back up from our account management team. Our boiler technicians are 100% reliable, polite, professional and focused on completing their work to the highest standards. All our work comes 100% guaranteed and we are fully covered by our public and professional indemnity insurance. We are happy to tender for any size of complex large or small as we have the resources to fulfill all contractual obligations. We normally service boilers for between €59-€89 depending on the make and model. There can be further reductions for management companies with multiple units. If you require further information please contact Boiler Services Dublin on 01-8326699. One of our senior managers will be happy to discuss your needs with you.